This Quantum 7 world should probably be more properly called “Hamilton,” or perhaps “Burr:” the accidental death of the former ensured the latter’s survival, to what would be disastrous effect for the United States a decade later. Hamilton’s feud with first the Jefferson, and then the Madison Administrations helped turn the Hartford Convention from a mildly ineffectual organized protest against the government into a full-fledged secession movement; by the time of his death in 1826 (ironically, the same year and day as arch-foes Adams and Jefferson) the country that he helped create had been broken in half, and increasingly under the sway of a British Empire that meddled in North American politics with an ever-heavier hand for next half-century. It was only with the Treaty of St Louis in 1876 that the American successor states were able to find enough strength to regain full autonomy. The resultant prosperity is now being endangered by an aggressive (and quite Prussian-influenced) Empire of Mexico; and the British Empire is now too busy worrying over a looming Great War to consider offering much help to her ungrateful American nieces. While Europe prepares for a general war, a balkanized, but reknitting North America faces the threat of an expansionistic Empire of Mexico. 1801: Aaron Burr dies of dysentery. The British Empire may not have expected Alexander Hamilton to be such an enthusiastic supporter of the Hartford Convention, but they certainly had no compulsions against using him and others to detach New England from the rest of the United States during the War of 1812. The resulting Hartford Confederation would set the standard for England’s systematic dismantlement of the United States of America; hunks of territory would be chopped off and turned into client nations dependent on British goodwill for survival. Thus the Gulf Coast region (acquired after the British victory at New Orleans) was later sold to the new nation of Texas in 1838; the Midwest was “encouraged” to secede into the Republic of Deseret in 1841, supposedly to give safe haven for Mormons and runaway slaves; and the Republic of California was carefully set up after the British-Mexican War of 1848. By the time that the USA’s Centennial rolled around in 1876, it was to all appearances a client state of the Empire itself. However, fifty years of meddling had made the British Empire both very arrogant and very resented in the Americas – including, ironically, by the Hartford Confederation itself, which found its trade concessions to England more restrictive every year. This, coupled with lingering Texan anger over the heavy-handed anti-slavery sanctions of the previous generation, Californian resentment at their British-imposed demilitarized status, and even Deseret’s weariness over being a convenient cat’s-paw for the latest British scheme, meant that Britain’s sway over North America was not as secure as appeared. All that was needed would be an excuse. The excuse occurred in 1874. The Franco-Prussian War of 1871-1873 had, thanks to British intervention and some critical delays, ended in French victory; in retrospect, the movement by Austria to unite the rest of the German Confederation should not have been the surprise to Europe that it was. Neither should have been Austria’s unsubtle “encouragement” of defeated Prussian loyalists to emigrate to Maxmilian’s ramshackle Empire of Mexico, which had by this time largely become a convenient exile point. The British Empire’s sudden need to counterbalance the sudden threat in Central Europe meant that it was critically distracted in other, lesser arenas. So when the Republic of Quebec declared independence in 1874, the British were startled. They were even more startled when California, Deseret, the Hartford Confederation, Texas, and the United States all immediately recognized the new country, then proceeded to guarantee its security. 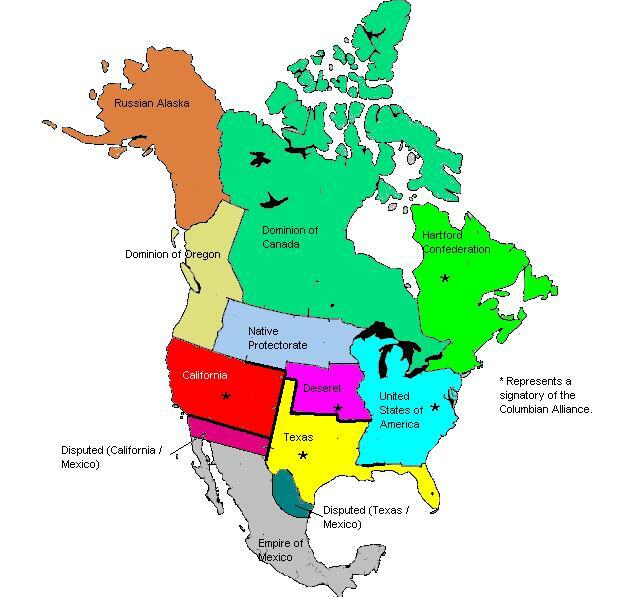 The set of treaties between the six countries – soon to be five, as the British eventually saved face by “selling” Quebec to the Confederation – would eventually result in the 1876 Treaty of Columbus, which was a comprehensive set of military and economic agreements that created the “Columbian Alliance.” The treaty members agreed to no tariffs between signatory states; standardization in weights, measures, and coinages; joint military training and operations; and the resolution of a whole host of built-up problems and disputes that had arisen over the last sixty years. It did not reunify the United States of America, which remains merely one more signatory – but a good deal of the Alliance’s diplomatic work goes through Washington, DC. Economic matters are the purview of NYC, which is the Confederation’s unofficial capital these days; and the Alliance’s military is increasingly being based out of Denver, Texas. While the Alliance was originally (and unofficially) put in place to make European nations thoughtful, it has more or less evolved into a counterweight for a revitalized Empire of Mexico. Prussian immigrants were instrumental in reforming the country’s military and industrial capacity, and have encouraged an imperialist mindset in the ruling class. 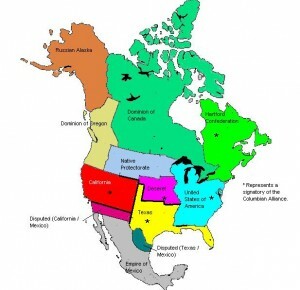 This, coupled with long-standing border disputes between Mexico, California and Texas, has put the North American continent at high risk of war… which mirrors the diplomatic situation in Europe, where the British, French and Russians are even now trying to contain the Austrian Empire. Any trigger would do. Infinity severely downgraded the accessibility to this timeline once it became clear that its version of World War I was merely being delayed, not avoided. Maxmilian is not precisely a valuable trading location anyway – there is some market on Homeline for Deseret’s handicrafts, and Austrian handguns always sell well on Dixie-3 – and the tourist trade is not especially noteworthy. What researchers that have stayed are there mostly to track the coming war, or Centrum (see below). Miracle Workers is preparing for a larger presence. Centrum, on the other hand, seems to be disproportionately interested in this timeline. Infinity has not yet worked out why: it’s because Maxmilian is on Interworld’s list as being highly likely to have its own version of the Final War within thirty years. Maxmilian’s technological level is a moderate-to-high TL6: while military state of the art looks regressed, it’s because none of the various industrial nations have fought actual organized wars since about the 1880s. However, they are aware of the possibilities inherent in tanks, automatic weapons, bombers, rocket bombs, poison gas, biological weapons… worse, when compared to Homeline the current knowledge of physics is actually slightly advanced in this timeline. Nuclear weapons will probably appear on this timeline in the next fifteen years; not soon enough to be a factor in the war coming up, but just in time to be a potential weapon in the war after that. Centrum is still working out a way to neutralize the problem.